America’s Great Loop. Google it. 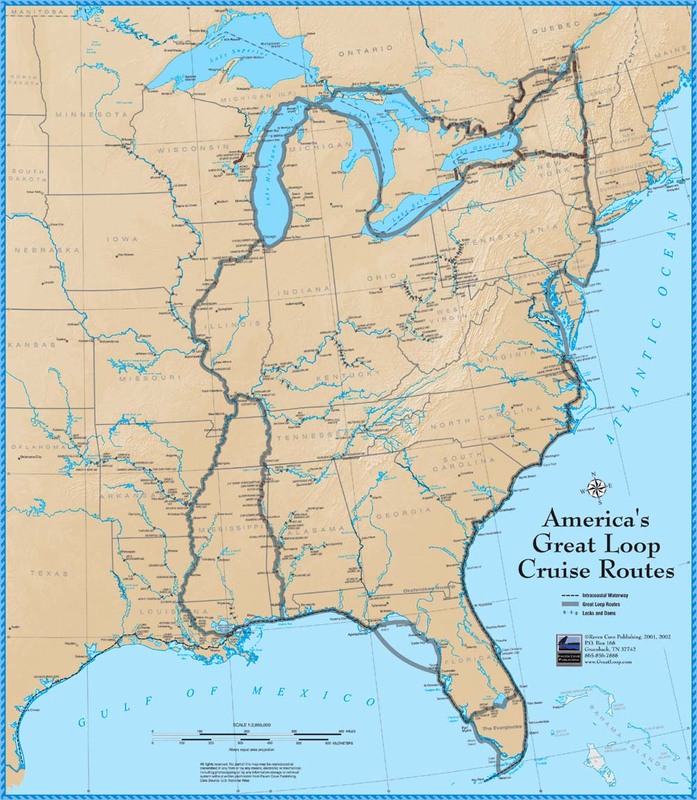 Depending on how many side trips you choose to take, the Great Loop is 5 to 7 thousand miles of inland rivers, and waterways, circling the eastern half of America. For us this included 13 states and three counties. America the Bahamas and Canada. On average it takes a boat like ours a year to complete the circle. Between running out of money, encountering break downs both mechanical and mental, one year turned into two. The GREAT LOOP ASSOCIATION is a great source of information for those interested. Katie and Jessie: I stumbled across your blog – WOW! what great fun. Growing up on KY Lake, I had pleasure of learning to (power) boat. When I move to Seattle 20+ years ago, I eventually graduated from “lake boating” to “destination boating” and now cruise from San Juan Islands north into BC and outer Vancouver Island. Reading your blog made me think about how I dreamed as a young girl of boating from lock to lock to eventually reach the Guld of Mexico. Glad to read about you girls doing it. Sounds like you’re having a grand time – a constant adventure. Have you played the game of “sink or swim”? Ha! hang in there – nothing like experiencing the world from afloat! Safe travels – and have nothing but fun! Very cool journey. I grew up on a sailboat going all over the caribbean and a little bit in the mediterranean. It is the best way of life. Did you figure out your engine issue? If you need help with that or anything else, my brother is the captain of a ninety foot racing sailboat. They are arriving in Cape Canaveral in 3 or 4 days and will be there until early february. Then they race to Jamaica. Anyway, he is top notch mechanic and is happy to help new boaters out. The boat is called Donnybrook and his name is Freddie. Good luck on your adventures! Agreed, it is the best way of life! By far the most amazing way to see new places. Luckily it was just a busted freeze plug. Nothing serious, and we are good to go now. Thanks for the contact, you can never have too many. Glad to hear it was not serious. If you decide to head south and go for the open ocean and need any advice, feel free to contact me. nmm2143@caa.columbia.edu. I have sailed thousands of miles in the Atlantic. Ocean sailing is really the way to go. Don’t let the journey end with the Great Loop. Sail around the world next! You chicks are rad! Really going for it — cheers! I have been sailing the South Pacific for the past 2 years but am not nearly as cool as you because I am sailing with my parents, but hey, I will take what I can get! Any plans to go to the S.Pac? It’s a lot of ocean but there are little pockets of paradise dotted all over it! Sorry I didn’t meet you guys. You were aboard my boat James Gang the Tartan 4700 at the Miami Boat Show. I hope your trip is the great adventure you want. Doing it on a little boat makes it ever more special. I did the same 25 years ago on a 27 ft Trimaran . We completely fell in love with James Gang… we probably sat in “the living room” for an hour pretending it was our boat, and welcoming every person who came aboard. It was fun to dream : ) Thanks for checking out our site, and if we ever win the lottery, I will contact you with a generous offer for your vessel!!! JEFF AND DONNA!!! we miss you! Just had lunch with johnny and doris on “bout time” and sounds like they had met with you in the bahamas… jealous. Our last shift at work was last night, we plan to leave saturday… depending on the weather of course. I know we will run into you somewhere, and can’t wait for the moment it happens. PS we have a bimini now, just in case you happen to spot us from a distance and don’t think it’s us! We are in Nassau Sunday May 13 and we don’t see you guys at the Harbor Club. Wondering how you’re handling the “transmission”? Angler Em – can’t thank you enough for all of your help while you were here. A new one just got flown in from that guy Bill in Lauderdale… should be out of here in the next couple days. This is the Motley crew. We are headed back toward Nassau from Staniel tomorrow morning. Any idea where do you expect to be tomorrow night? you are in reality a just right webmaster. The site loading speed is amazing. Henning from Flying Free. Jealous that long after we are back at work, the two of you are still out there living the life. You two were an inspiration from the day you started. We enjoyed spending time with you at turners in mobile. Best of luck as you progress north. Hi Girls, Its John and Wendy (The Regal J.A.C.E) we just wanted to drop you a line and say it was great to meet you. Fri night at the Lovesick lock. Good luck the rest of the way. You are entering the very best part of the system. You Girls are inspiration to all, and further proof that you really do meet the best people boating. Hi Girls, I just read your article in CO on the weekend and then I checked out your blog. Imagine my surprise when I realised that you stepped your mast in the marina that I keep my boat and that you also know Mark and Jo. It can be a small world. You both are an. Inspiration. My friend Lance and I are looping right now. Left out of Chicago. We are currently anchored in Hennepin. Wish we could meet and break bread and swap stories… Locks, logs, folore. and all.Lol This is afer all an adventure of a lifetime, that few are willing to explore.. So happy that i left NYC on a wing and a prayer. Life is so amazing when you let go and make dreams come true. This is living!!!! I feel so connected to this beautiful land, our history and even you our Sisters on the loop. Thru grace maybe one day we will meet. Blessings to you Katie and Jessie. Where are you now?!? I am jealous as I sit here in northern michigan by a fireplace… you’d think I would have gotten boating out of my system. Congrats on “living” I am very excited for the rest of your journey. what’s the advantage of going thru Alabama instead of going down the Mississippi? What’s the advantage of going the longer route through New York? I have to say Both of you are very brave. I would love to hear your great adventurous story. Any link please. I just stumbled across your blog and love your writing and admire your adventure. I am just now considering a Great loop trip. One question. How do you handle the low bridges? My understanding is that there are a couple of bridges in the 15- 19 foot range. I already have a 41 Morgan OI sailboat which is almost paid for and have been thinking about buying a trawler for this trip. It appears I could do it on old Plan B – my Morgan 41 sailboat. What is your advise? You up-step the mast in or before Chicago… (ship or carry it on deck) and re-step in Mobile Alabama ! And unstepping once more upon entering the Hudson river, and re-stepping in the Great Lakes. It is totally possible in your boat ! My boyfriend and I looking at sailing the Great Loop and I was wondering approx how long it took you to get from Chicago to the Gulf of Mexico? Just over two months…. could have happened quicker but we didn’t rush it ! Has anyone ever completed the loop in a Silverton 31c fly bridge? We’re thinking about going Chicago to Mobile, AL, & want to know if anyone has done it? ? What was lowest bridges, I have 53′ ,mast height 65′ ,cause want to take the loop!! Bridge clearence is pretty low, you will have to unstep and restep your mast ! I think there is an amtrak clearance in Chicago roughly 18 feet, the rest of the rivers is 52 feet. We had similar mast height. We shipped our mast from Chicago to Mobile and then had to go the long way around Florida, but other then that had zero problem with the mast. Of course it had to come down again to traverse the Erie Canal. Did u ever consider doing only the eastern portion of the loop?